Harpooning is not the worst, but pretty thin gameplay-wise. No one ever explains why Edward instantly has all the skills of an assassin, he just puts on the outfit and boom. On one hand, I definitely don’t care. On the other hand, wut? Are we ever supposed to believe that “Captain Kidd” was passing for a dude? After a good 30 or so hours spent with Black Flag, I feel just as conflicted about the Assassin’s Creed series as I did when I started. On one hand, the sheer amount of fun to be had on the high seas makes this an easy recommendation. Sailing, sneaking, swinging and stabbing are all as enjoyable as they need to be to keep a gamer invested. As I said above, it’s hands-down my favorite Assassin’s Creed game I’ve ever played. On the other hand, if you have your doubts about the series as a whole, this is unlikely to be the game that changes your mind. Despite its slick presentation the storytelling remains deeply flawed, many aspects of the gameplay feel pointless, and certain persistent quirks of the series’ mechanics go un-fixed. 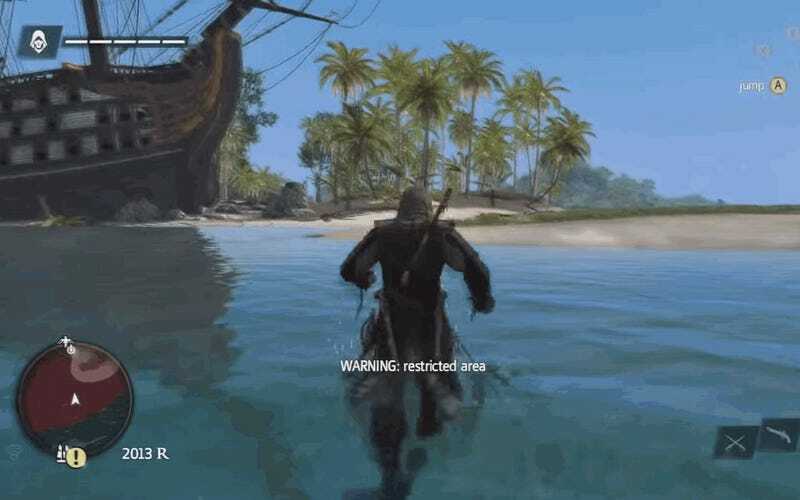 But regardless of how familiar these problems are, the Assassin’s Creed IV offers some truly unique pleasures all its own, and it does so with flair. I certainly don’t regret the time I spent with it, and while that may sound like faint praise, time is a precious resource. “Not wasting it” is enough of a victory for me. Addendum: I just started playing the Freedom Cry DLC, and will weigh in on that soon. But my first impression is that it’s even better than AC4, some minor quibbles aside. Stay tuned for details.